Recently migrated a site from one server to another using the awesome ManageWP dashboard, but was unable to login after the cloning was complete. Using credentials I knew were correct, I kept receiving the message “ERROR: Cookies are blocked or not supported by your browser. You must enable cookies to use WordPress.” This, despite having cookies enabled in Chrome. There are some other possible causes of this message, but check this first if you’ve encountered the same issue. After disabling all plugins and active theme, I was still unable to login, so I took a closer look at WP-CONFIG.php. At the top was a line added by the popular W3 Total Cache plugin still referencing the old domain. Removing this line (and the odd paragraph symbols indicating invalid line endings) I was able to login without the message. 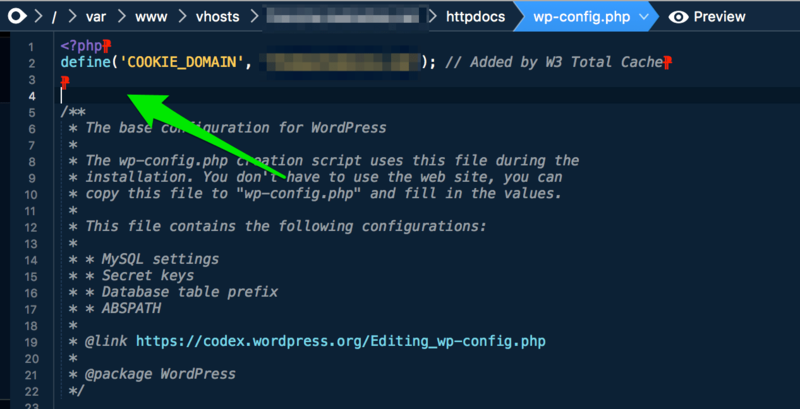 You’ll need FTP access to edit WP-CONFIG.php. Be sure to check out other possible causes of this message if it persists. If you found this useful, be sure to click “Like” on this post and follow us on Facebook and Twitter.